I’ve got to admit, I was not very good about swatching before starting a project for many years. Most likely because I was using cheap worsted weight acrylic yarn that doesn’t really change gauge much for so long that I didn’t think it was necessary. Using real yarn has taught me the value of doing a gauge swatch first. That and reading the book Custom Knits Accessories by Wendy Bernard. I rarely follow a pattern to the letter, so swatching is pretty important. I’ve even started washing the swatches to see how the yarn does in a normal wash cycle, so I know whether or not it will be okay to wash the final product. Much better to find out that a small square shrinks than having an oddly misshapen hat or glove at the end of laundry day. I’m casting on two projects this weekend:Starry Stole (swatch 1) and Zooey (swatch 2). I knit the swatches Wednesday, hand-washed them yesterday, and now I am ready to measure once more to be sure and cast on. Oh, and my other swatch project is still going strong. Up to 297 out of 400 right now according to my Google+ Photo Album. Only 103 more to go. …But not as many as I had hoped. Though I did pass the halfway mark. I had planned for 400, and I made it to 221 according to my pictures. I’m going to continue until I’ve done all 400, but I’m not going to worry about getting them all done anytime soon. I’ve got too many other projects I want to get to and these stupid squares have just been getting frustrating. I may be slightly behind on my 400 Stitches in 60 days project, but I am still clipping along at a fairly good pace. In 29 days I;ve finished 89 swatches. I may need to speed it up a bit. Luckily, I got myself a yarn ball winder to make flat-bottomed, center-pull balls out of my yarn skeins and hand-wound balls. Much easier to deal with the yarn in this configuration. Also, way too much fun. So much fun that, when I mess up on a swatch or get a few done from a ball, I’ve been rewinding the yarn a few times. Speaking of the yarn, I am really burning through the stash well. I have used up six colors so far in this project. According to the estimation on my Ravelry project page (which currently shows two extra colors of yarn I just wound and tossed in the basket today for the next swatches) I have used 1,628.9 yards of yarn already. 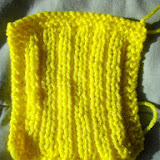 You can also always see my progress on my project page on Ravelry. I’m also going to put a little bar right over in the side to keep track of swatches numerically. Now, if you’ll excuse me, I need to go cast on another swatch to catch up.